Macro Ops Podcast: Tesla On The Brink, Eurodollar, and Uranium with Biren Shah Part 2 — Chris and Biren rehash the $TSLAQ thesis and then hit on some interesting trade ideas in eurodollars and uranium. Macro Ops Podcast: Global Macro and Value Collide with Mr. Bean — Chris and Mr. Bean talk value, health, lifestyle, wellness and longevity. Perspectives on Risk — Euan Sinclair, one of my favorite option specialists writes about risk. Euan mentions how successful risk control is a MUST if you want to walk away from the markets with more than you started with. Risk control is not all you need. A seemingly prudent rule like “only risk 2% on any trade” is both wrong in its arbitrariness and misses the point that if the trade has no intrinsic edge this rule will just lead to bankruptcy one 2% loss at a time. A related piece of stupidity is that discipline is what will lead to success. Executing a trade with no edge in a disciplined manner is worse than executing it in a haphazard manner. If you are inconsistent at least you will avoid some of the inevitable losses. Sycophants and Other Party Stories — I think Kevin Muir over at the Macro Tourist has done a great job covering the epic shift in Fed policy we saw between Q4 of last year and Q1 of this year. Kevin points out that Trump has succeeded in beating the hawk out of Jay Powell. And for his next party trick Trump plans to appoint Stephen Moore to the FOMC — someone who thinks the Fed should lower rates by another 50 basis points! Also as of this writing, there’s rumors circulating that Trump will select Herman Cain to fill the other open FOMC seat. Moore and Cain are two political loyalists that will sit on the board of the Fed. Trump can use them to keep Powell inline and the markets propped until his reelection in 2020. Yield Curve Inversion: Maybe It’s Different This Time — SRVN asset management put out a note on how to interpret the recent inversion in the US yield curve. Rather than call for an immediate recession SRVN reflects our recent sentiment, that the inversion we are seeing is no cause for concern. SRVN writes how the yield curve changes depending on the term premium — the additional yield investors demand for running the risk that short-term interest rates don’t evolve in the expected manner. Here’s more on the term premium in case you need a quick refresher. Accounting for the ACM model term premium, the plot of the yield curve actually ends up looking normal. Check out the post for more details! These three hedge fund managers on the roundtable all specialize in long volatility and positive convexity trading. Over the course of both parts the three discuss why trading volatility from the long side has been so tough with overly accommodating central planners. All three of them think the period of central bank volatility suppression will end soon. The term structures are flat and downward sloping on many of these products which means you can buy long-dated volatility that has positive carry. This makes for an extremely attractive trade structure. I’ve been looking for a shiny new growth name to watch and The Trade Desk (symbol TTD) came up on my search. 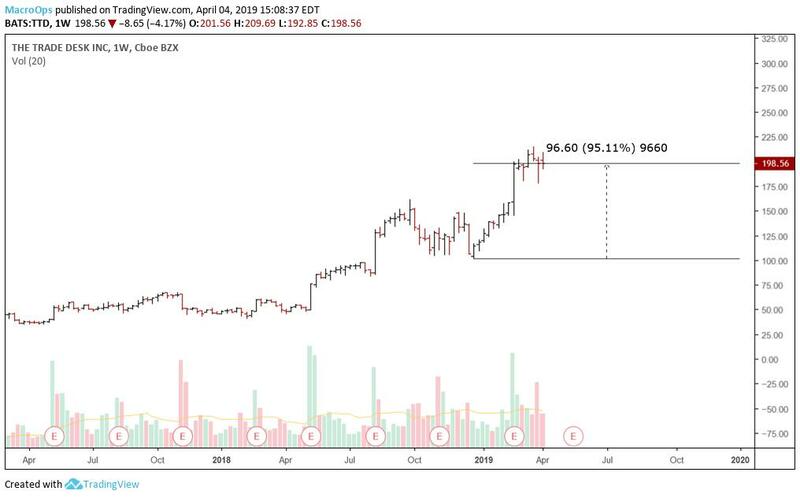 This stock has been on absolute tear, up over 95% since the December sell-off. The Trade Desk is where people go to buy and manage data-driven digital ad campaigns. This company is really starting to gain some steam, sales growth increased 56% in the fourth quarter, up from 50% in the quarter before and 42% the year before that. Gross spending on the Trade Desk platform increased 51% to $2.35 billion. There’s no reason to believe the momentum is over either. Trade Desk specializes in programmatic advertising, which is a small $33 billion subset of the $725 billion advertising industry. As the years progress data driven companies will want to continue steering their dollars into programmatic advertising since it’s easier to measure success. Chinese stocks have been ripping since the beginning of the year and that’s because the economic data coming out of China has been on a strong rebound. 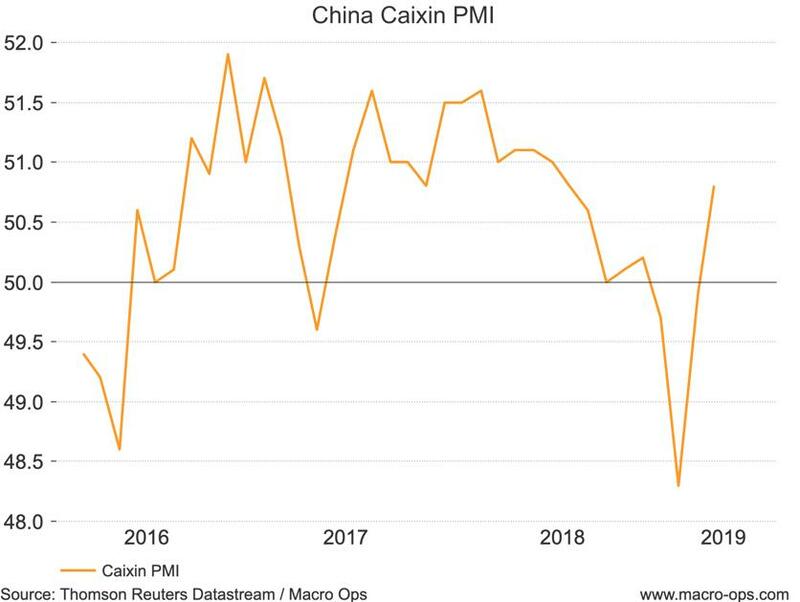 Check out this graph of the Chinese PMI. It’s above 50 which means the Chinese economy is expanding again. If you don’t have targets and guidelines set for your trading process you’ll never be able to improve. Evolution requires a consistent measure of your results. If you’re not already, be sure to follow me on Twitter: @tylerhkling. I post my mindless drivel there daily.